Here is a coming attraction that you should really be excited about! The Town of Canton, in partnership with NepRWA, was just awarded $134,784 from MassDEP and EPA to prevent stormwater pollution at Devoll Field and the the Luce Elementary School. The grant will fund the construction of rain gardens and other types of green infrastructure that collect polluted stormwater and filter it through specially selected plants and filtering soil. 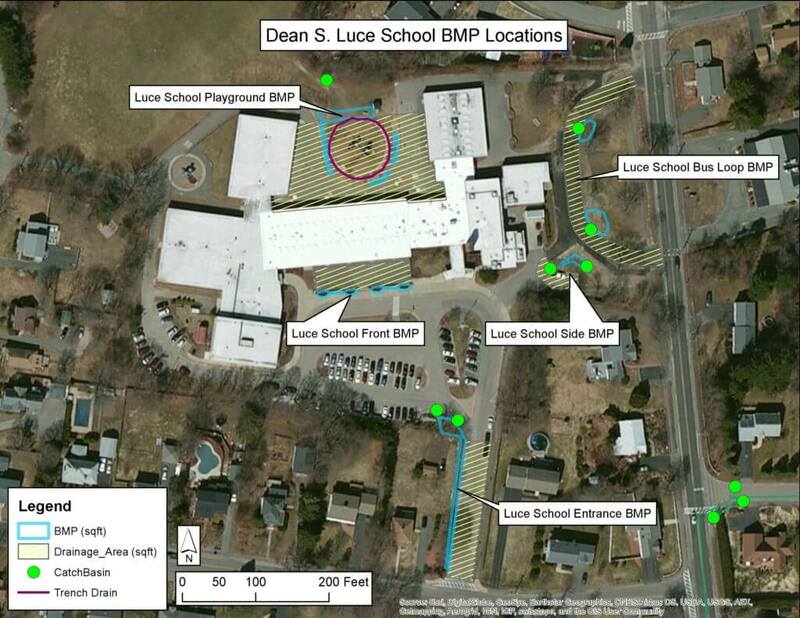 Projects built at the Luce Elementary School will have the added benefit of serving as an outdoor classroom for hands-on learning experiences about stormwater. Improvements include a water quality swale and a large bioretention cell. The town currently stores its massive snow piles in the parking lot at Devoll Field. You can even see it in the aerial photo below; notice the huge black blob in the lower right corner of the parking lot. As the snow melts debris, asphalt bits, and salt gathered from the streets by snowplows run off directly into the adjacent Beaver Meadow Brook. During the rest of the year when there isn’t snow, rain washes trash and car-related pollution off of the parking lot and into the brook. 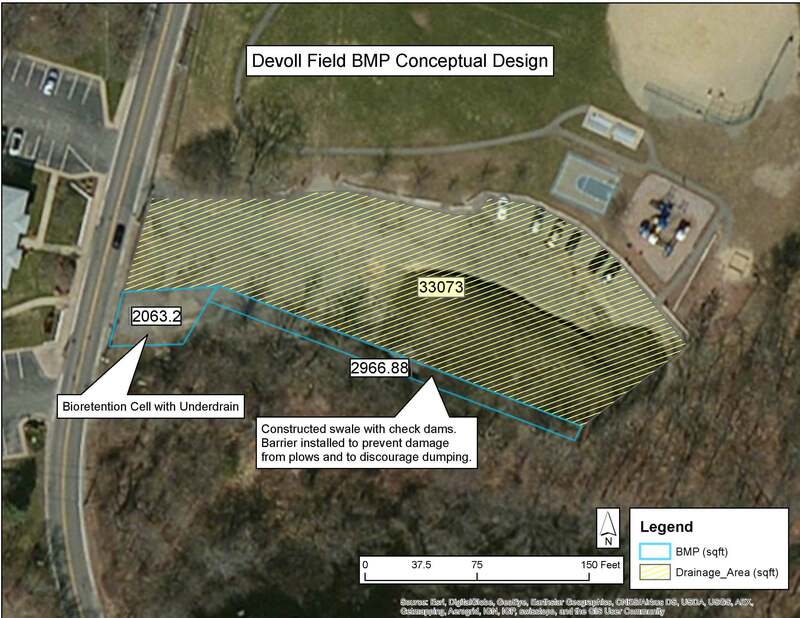 With the new and improved site design, flows will be collected by a swale which will soak runoff into the ground while transporting the rest to the bioretention cell. The bioretention cell will filter pollutants out of the remaining runoff through special plants and soil before discharging clean water to the brook. Improvements include rain gardens, swales, and bioretention basins. A series of four beautiful rain gardens will be built in the front of the school that will provide a great opportunity for student involvement. Four small bioretention cells will be constructed around the parking lots and bus loop to collect and clean stormwater coming off the parking lots. Finally, the playground in the back of the school will be getting major upgrades to fix a serious erosion problem that is polluting Pequid Brook with sediment and nutrients. Click here to learn more about stormwater pollution and what you can do to prevent it. This project has been financed with Federal Funds from the Environmental Protection Agency (EPA) to the Massachusetts Department of Environmental Protection (the Department) under an s. 319 competitive grant. The contents do not necessarily reflect the views and policies of EPA or of the Department.